This was the largest political mass shooting in Canada in 25 years, and the first time Muslims had been killed inside a mosque in North America. Today, on the two year anniversary of this attack, of this terrible act of Islamophobic violence, it is vital that we not only commemorate these lives lost but also reflect on how we are all responsible for resisting Islamophobia in Canada, in all of its forms. Today January 17, 2019, marks exactly one year since the Canadian government announced it would create the Canadian Ombudsperson for Responsible Enterprise (CORE), an office to independently investigate allegations of abuses by Canadian companies operating overseas. Read more about One year after the announcement..where is the ombudsperson? UPDATE: Council staff member Rachel Small was arrested and charged during the protests against Steve Bannon and David Frum's debate on Nov. 2. She was one of 13 people arrested that night, of the 1500 people that mobilized outside Roy Thomson Hall to reject hate, white supremacy, white nationalism, imperialism, and violence in our communities. The following blog, written a few days before the protest, explains why she took a stand against Bannon being given a platform at the Munk Debates. I was invited to speak on behalf of the Council of Canadians at the Niigaani-gichigami Gratitude Walk on June 8th. "Let's take a brief look at each of Hudbay’s current and former operations. New Human Rights Watchdog Announced; But Will It Have Teeth? 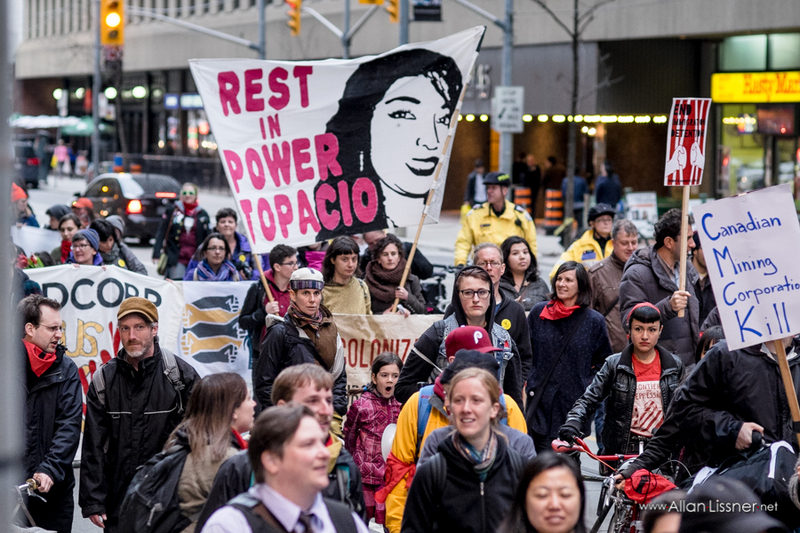 Photo caption: Activists in Toronto protest the murder of 16 year old anti-mining organizer Topacio Reynoso Pacheco. She led youth in her community in opposing Canadian company Tahoe Resource's silver mine in Guatemala. This week, François-Philippe Champagne, Minister of International Trade, announced the creation of a new human rights ombudsperson who will investigate allegations of abuse abroad concerning Canadian corporations. Champagne explained that the new watchdog, named the Canadian Ombudsperson for Responsible Enterprise (CORE), will be empowered to independently investigate complaints of human rights abuse at the hands of Canadian companies, to make public recommendations for remedies, and to monitor the implementation of those recommendations. Read more about New Human Rights Watchdog Announced; But Will It Have Teeth? Mark the 5 year anniversary of Idle No More on Dec. 21st in Toronto! Join us in Toronto on Thursday as we mark the five-year anniversary of this amazing social movement. Read more about Mark the 5 year anniversary of Idle No More on Dec. 21st in Toronto!